Continuing on with the Frocktober outfits. I'm doing a #31Days31DifferentDresses challenge and wearing a different dress every day in October to raise funds for Ovarian Cancer Research. Every donation helps! Thank you to everyone who is donating to this great cause. It was a little chilly, so perfect time to wear one of my warmest dresses. And since it was Hat Day too, I was able to meet the #myStyleOctober challenge of 'hattitude' by wearing a cosy beanie. Layered up with a scarf as well as it got quite cold with the wind and rain. I was so grateful to be wearing this dress, and not just for the extra warmth. The dress has a longer hem in the back that comes in helpful for toddler wrangling. I spent the morning at the accountants getting my tax done, having had to take toddler T along with me. Although he did sit there quietly 'reading' a book most of the time, every now and then he'd try running around. He managed to drop down and crawl under the accountant's desk at one stage! Last worn: knitted beanie, skull scarf, striped tee dress, Chelsea ankle boots, Balenciaga Part Time bag. Other ways to wear: knitted beanie in the office, pink skull scarf with blue and teal, striped tee dress in winter, Chelsea ankle boots and jeans, Balenciaga Part Time bag and denim. We went out for dinner in the evening with hubby's family, so I figured I'd wear one of my 'dressiest' dresses for the occasion. I'm trying to plan out the month so I'm not left with something completely inappropriate to wear near the end! Dinner out seemed like the best time to wear such a formal dress. We weren't doing much earlier the day though, so I tried to dress this down a little, and settled on the denim jacket and casual bag. 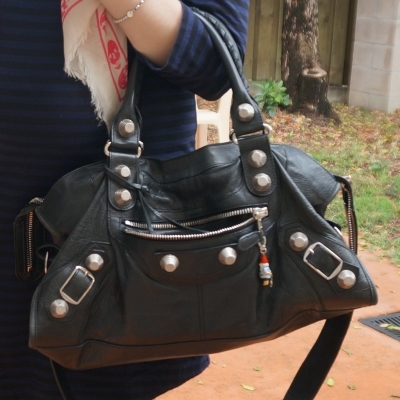 I've been wearing my Balenciaga bags a bit lately! This dress hasn't been worn much - it's been almost 10 months since I last wore it! It's definitely staying in my wardrobe though. I just don't wear it much as I keep it for more formal occasions. I think it's perfectly okay to only wear a floor length formal dress a couple times a year. I expect my 'everyday' wardrobe to get worn a lot more though! Last week I shared about the Shopbop sale, so I wanted to share with you all what I bought too. I picked up a couple things, after feeling like treating myself as I ended up doing #noSpenderSpetember! Last worn: Ray-Ban Wayfarer, denim jacket, snake print maxi dress, Ikwetta sandals, Balenciaga sorbet city bag. Other ways to wear: denim jacket and a maxi skirt, snake print maxi dress at 39 weeks pregnant, Ikwetta sandals and a maxi skirt, pink Balenciaga sorbet city bag in the office. Linking up with Shoe & Tell, Mix It Monday, Trendy Tuesday, Turning Heads, Style Sessions, Confident Twosday, Wardrobe Wednesday. The Mini Tote is really cute. And I'm obsessed with the bracelets you are wearing in the video. Yep it's definitely one of the more formal dresses in my wardrobe! Totally agree about formal dresses, however I realise I have too high of a formal dress to average number of formal occasions attended in a year ratio so I feel a clean out is in order! It must be a pain finding maxi dresses and being taller! I'm a shortie so I just have things hemmed most of the time! I am in love with that snake print dress! So pretty on you!! There is no way of hiding the bump in your last picture. It looks adorable! Yep, definitely too big to hide now! I love that snakeskin dress, sooo pretty! But I can see why you don't wear it all that much, I'd be the same way, haha, especially since I rarely wear maxis. I wear my maxis quite a bit - but the longer length with this one and the style and print, I tend to think of it as too dressy for daytime! I love maxi dresses the print is very nice! You look gorgeous dear lovely dresses! Both of these dresses are fantastic! The first one is so cute and looks perfect to keep you warm on chilly days! I so love that long maxi one and I agree to keep it in your wardrobe even if you only wear it once a year. I love it paired with a jean jacket! Yes to the Alexander McQueen scarf! I love the addition of a scarf to a dress, it just adds such a great detail, you know? And the snake print maxi dress is just gorgeous. Love the maxi Mica, especially with the bump you look beautiful!! Your toddler ofcourse had to investigate under the table..so much treasure is to be found at the accountants table!! LOL. haha yes! He thinks wherever he can't go has the most interesting things in the world! I love that you use your existing wardrobe for maternity. There were a few things I had to purchase near the end of my pregnancy, but for the most part, I wore my regular clothes. Maxis just work for absolutely everything! I love that this dress can be dressed up or down! Yes I love how well maxis work in pregnancy - dresses and skirts! I'm looking forward to just reusing what I already own as much as possible, I still kept a few maternity items from last time. You look so cute with the strpied tee dress, the beanie worked as the perfect touch to make it look chic! I loved the maxi dress' pattern, the dress is perfect for a dinner, as you said. You look beautiful in both outfits, dear. Love both dresses. Love the casualness of the first with the beanie. The second dress is gorgeous. Oh, don't just save it for best though. That's a dress that should be worn more! It should be worn more, it's very pretty! It really does feel more formal and dressed up to me though. I can't believe it's been 10 months since you last work that, I feel like I remember it more recently! It’s great to always seeing you support important causes. I love all your outfits too. How crazy is there weather lately.. It’s been quite random here too. I love the navy striped dress in the first outfit! It's a wonderful cause to support, I'm glad to be able to participate this year. Stripes are always my favorite! But I'm loving both of these looks. I like both dresses. And the bags are amazing! Loving how you've styled your first outfit hun and the beanie is too adorable! 2 great dresses this week Mica. You styled them both very well too. You look so cute in a beret and especially paired with the stripes, I see a little Parisian nod to your first look! You are rocking at Frocktober! Loving that striped one on you! The pink one is DIVINE!! Love, love, love it!! Want it! Both of these are great looks and great dresses. 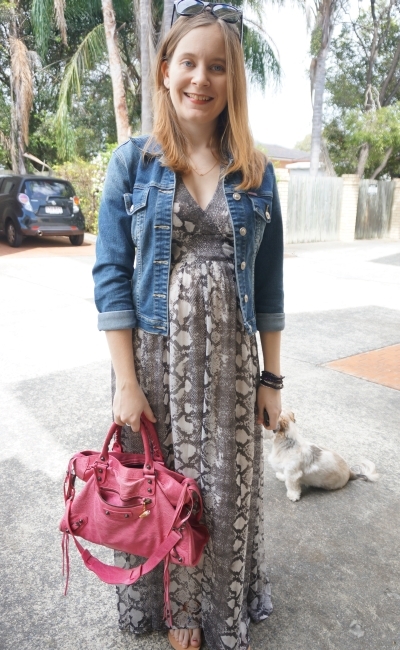 I love how you made that snakeskin print dress a little more casual with a denim jacket. It really works! Thank you, I think it did dress it down nicely! The snake print maxi looks so great on you! I love that you are challenging yourself to wear a dress everyday! It's an interesting challenge for sure! I'm glad to be able to support Frocktober and fundraise. Love that scarf in the first look! I am absolutely loving that second dress! The pattern and overall look is beautiful! That striped dress is so cute on you Mica! My favorite is that snakeskin with the denim jacket. Looks so good! Still living for that pink Balenciaga bag. And always love seeing you in your prize beanie!! I agree that a long dress doesn't need to work as hard as a shorter one too. haha thank you! I'm not really a hat person so much though. I am a fan of Balenciaga bags, so colorful and light! Love yours. I love both looks, fav is the maxi dress with the jean jacket, looks very versatitle.